As unlikely as it may seem right now, it won’t be long before the evenings start to draw out, the thermometer starts to creep up and the great outdoors beckons. With this in mind now is a great time to think about investing in an awning. A quality, professionally installed awning enables you and your guests to enjoy your patio without having to worry about the vagaries of the British weather. If the sun is glaring down then the awning will offer UV protection; if a short sharp shower comes along uninvited then you and your guests will remain dry. 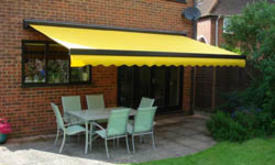 An awning also provides protection from the wind and is great for keeping the strong sunlight off interior furniture and carpets preventing them from fading. These days awnings come in a wide variety of colours and patterns so whether you are looking to make a bold statement or want a more subtle look you will be able to find something suitable. They are also fully adjustable enabling them to be easily positioned depending on the weather conditions at any given time. Being fully retractable means that your awning can be unobtrusively and neatly folded away when it is not required. 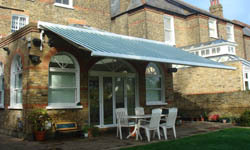 Of course, it is not simply residential properties that can benefit from an awning. Many pubs, restaurants and cafes use them to create additional space for customers. With the addition of a few strategically placed heaters, these outdoor areas can be utilised pretty much all year round. A quality awning, made from tough fabric will last a long time and is considerably cheaper than a conservatory or extension! So to see how AJS Garage Doors can help you choose the perfect awning for your requirements get in touch on 01992 630 404 or pop into our Cheshunt showroom.